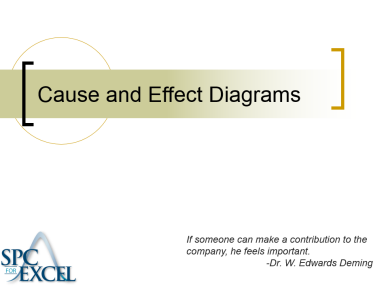 The purpose of this module is to introduce the cause and effect diagram - what it is, when to use it, how to construct, and how to analyze a cause and effect diagram. Creating a cause and effect diagram is enjoyable and educational. These diagrams are usually constructed as a team or group activity, in order to get ideas from as many people as possible. As a result of everyone contributing to the diagram, each person tends to gain some new knowledge. Cause and effect diagrams introduce new ideas about the cause of problems by helping the group think about different categories of causes. The cause and effect diagram also helps to show how much we know about our process. If the diagram is full, we know a lot. If it is sketchy, chances are we don't have a good understanding of our process. Cause and effect diagrams should not be idle documents. That is, we should continually search for the cause of problems, so that we may add to the diagram as time goes on.